President Trump and Russian leader Vladimir Putin chatted during November’s Asia-Pacific Economic Cooperation summit in Danang, Vietnam. "They are laughing their asses off in Moscow." That was one of President Trump's responses to the 16 indictments returned in special counsel Robert Mueller's investigation of Russian interference in the 2016 presidential election. He's right. Russian President Vladimir Putin likely is laughing – at Trump. The American president is so caught up in denying any suggestion that his campaign colluded with the Russians that he ignores the gravity of the situation, whether his campaign colluded or not. Trump should be reading the riot act to Putin. Mueller uncovered clear evidence that led to Friday's indictment of three Russian companies and 13 Russian nationals for conspiring to defraud the United States. Instead, the U.S. president continues to act like a fawning puppy at the mention of the Russian despot's name. Why? Trump has no problem criticizing President Barack Obama for not stopping the Russians from meddling. But not only did Obama in September 2016 warn Putin to "cut it out," he followed up the threat with economic sanctions. Obama should have done more, but Trump has yet to challenge Putin at all. The American president's voice has been conspicuously absent as Putin helps Syrian strongman Bashar al-Assad annihilate innocent people thrown into a civil war. Another tragedy like the mass deaths in Aleppo is possible in the Damascus suburb of Ghouta, where dozens of women and children have been killed so far this month during Russian-aided bombing attacks that Assad says are antiterrorist operations. What is Trump's Syrian strategy? Who knows? Most days he's too busy tweeting defenses of his election campaign to talk about any foreign policy other than his push for construction of a bigger wall on the Mexican border. Trump has yet to show that he is a president capable of focusing on a multitude of concerns. Near the top of his to-do list must be this country's relationship with Russia and making it unequivocally clear to Putin that no amount of interference in our democracy will be tolerated. Why does Trump act as if Putin has the upper hand? Russia's shattered economy has made it vulnerable. Earlier sanctions and crashing oil prices pushed the country into a recession in 2015 and it has yet to fully recover. Economists say it won't so long as Putin, who resists fiscal reforms, is in charge. The best way for Trump to prove there was never any collusion between his campaign and the Russian meddlers into the U.S. election is to come out strongly for more economic sanctions to be imposed on Russia. Mueller has provided credible evidence to act. Nothing happens in Russia without Putin's personal approval. Trump needs to say very forcefully to Putin that his administration won't tolerate the Russian's aggression. The American people expect their presidents to stand up when attacked, whether by cyber means or otherwise. When is Trump going to deliver more than tweets about being a strong leader? 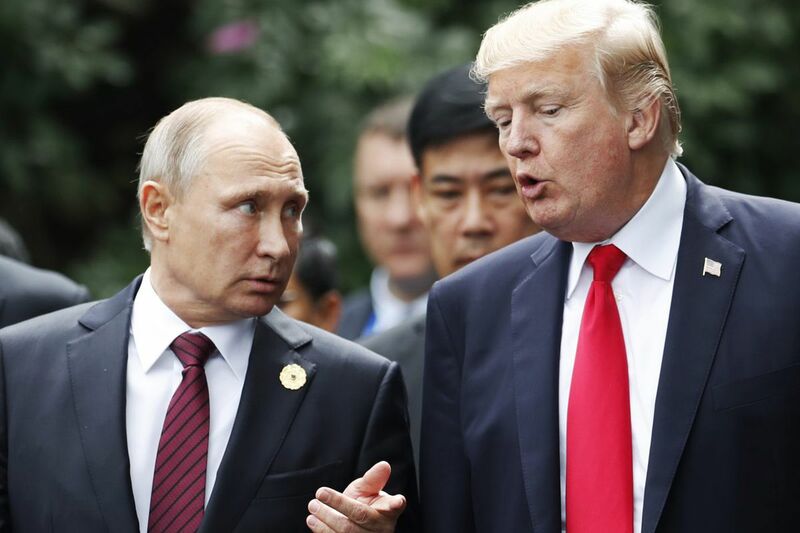 Unless Putin is put on notice now, U.S. voters can expect similar attempts by the Russians to influence the outcome of the midterm elections later this year. That must not happen.